Use the Rotate panel to Turn the Backdrop by degree steps, or Spin it continuously, around any of the XYZ axes. You can also use it to Pin the backdrop to a desired alignment. Click the number of degrees you want the Backdrop to turn: 5, 30, or 90 degrees. Click the XYZ plus or minus buttons to turn the Backdrop around the respective XYZ axes. Click the speed at which you want to spin the Backdrop: Slow, Medium, or Fast. Click the XYZ plus or minus buttons to spin the Backdrop around the respective XYZ axes. 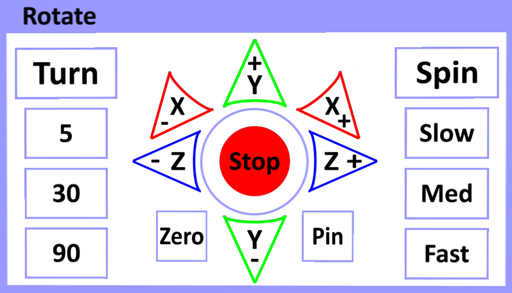 Click the red Stop button to stop the spin. Turn or Spin the Backdrop to the desired alignment. PhotoSpin Pro will now use this setting as the base alignment for the Backdrop. Click the Zero button to return the Backdrop to the pinned (base) alignment. Note: In the menus, when you Turn the Backdrop, and then Spin it, PhotoSpin Pro temporarily retains this final Turn positon as the point from which all subsequent Spin rotations occur. This step is bypassed on the HUD, so that the Backdrop simply returns to the pinned (base) alignment when you click the Zero button. The Resize panel allows you to change the dimensions of the Backdrop to virtually any size you want, up to a 10 meter limit on prim size. Click one of the size factor buttons (fS, fM, fL) to select the amount the backdrop will resize. Use the XYZ + or – buttons to increase or decrease the size of the backdrop. Click Join (XYZ all circled) to resize along all three XYZ coordinates at the same time. Click Unjoin (XYZ circled separately) to resize along each of the XYZ coordinates independently. Use the Reset button to restore the backdrop to the default size. Notes: The size factor ratios are as follows: fS = 1.1, fM =1.414214, fL = 1.732051. Textures will realign automatically as you resize the Backdrop.